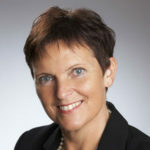 Bente Langdahl graduated from the medical school at Aarhus University in 1988 and did clinical training in internal medicine and endocrinology at Aarhus University Hospital. Bente Langdahl received her PhD at Aarhus University in 1995: “Investigations on a possible pathogenic role of thyroid hormones in postmenopausal osteoporosis” and received a DMSc at the same university in 2004: “The genetics of bone mass and risk of osteoporotic fractures”. In 2004 Bente Langdahl was appointed consultant at the department of Endocrinology and Internal Medicine at Aarhus University Hospital and research lecturer at Aarhus University. In 2012 Bente Langdahl was appointed professor at Aarhus University. Bente Langdahl’s main research interests are identification and further investigation of genetic variants that imply increased risk of osteoporotic fractures, osteogenesis imperfecta in adult patients, interactions between fat and bone tissues, the impact of thyroid diseases and diabetes on bone health, the effects of vitamin D and K on bone metabolism, and the development of new treatments for osteoporosis. Bente Langdahl is past-President of the European Calcified Tissue Society and the co-chair of the International Federation for Musculoskeletal Research.